When I first met my friend John Wong and learned of his love for cooking, I assumed he would be an Asian/Fusion expert. I know…Turns out, his go-to kitchen style is Italian. One of his specialties is Sunday Gravy. Sunday Gravy became famous, beyond the borders of Little Italy, from the kitchen scene in The Godfather where Clemenza is teaching Michael how to make Sunday Gravy, aka Mob War Sauce. Great scene! After John and his wife Gina brought a big pot of it to my house for dinner last winter I couldn’t wait to learn how to make my own. This past Saturday, I messaged Gina to see if John would be willing to share his recipe with me so that I could blog about it. They received my message while standing in the City Market trying to figure out what to cook for dinner that night. Gina answered so quickly, I’m not sure that John was actually consulted! Nonetheless, John showed up at my door half an hour later with everything he needed to prepare his famous Sunday Gravy. I gave him a knife, cutting board and pot and did my best to capture the magic. As you can see from the photos, this sauce is all about the meat or, better yet, the variety of meat. Pork back ribs, spicy Italian sausage and cheap beef meat each get their own sizzle time. 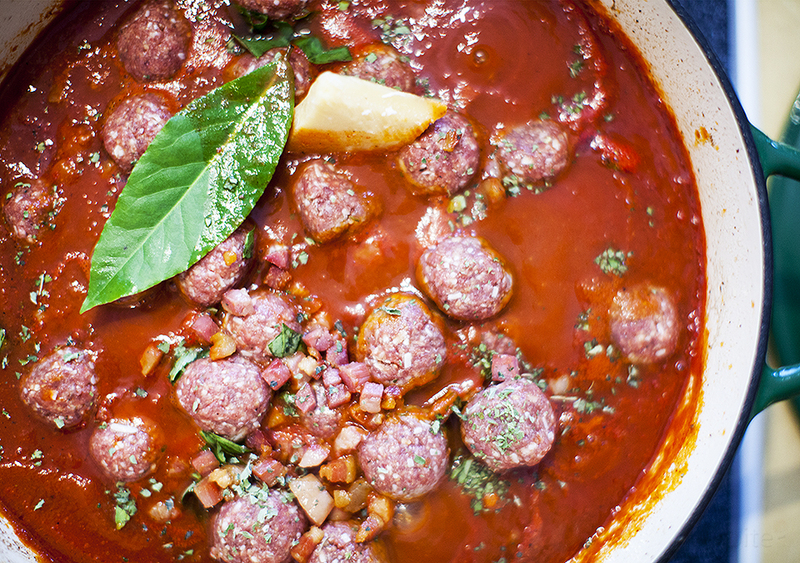 The tiny handmade meatballs are poached for hours in the final sauce. I was intrigued more with what didn’t go into the sauce than what did. Having already tasted John’s sauce, I’d made assumptions that turned out to be false. I use fresh herbs and garlic in almost all of my Italian cooking. John’s Sunday Gravy has no garlic except what he minces up for the meatballs and the herbs he uses are dried. To calm my concernes over the dried herbs, he finished the sauce with a bit of fresh basil. It wasn’t necessary. 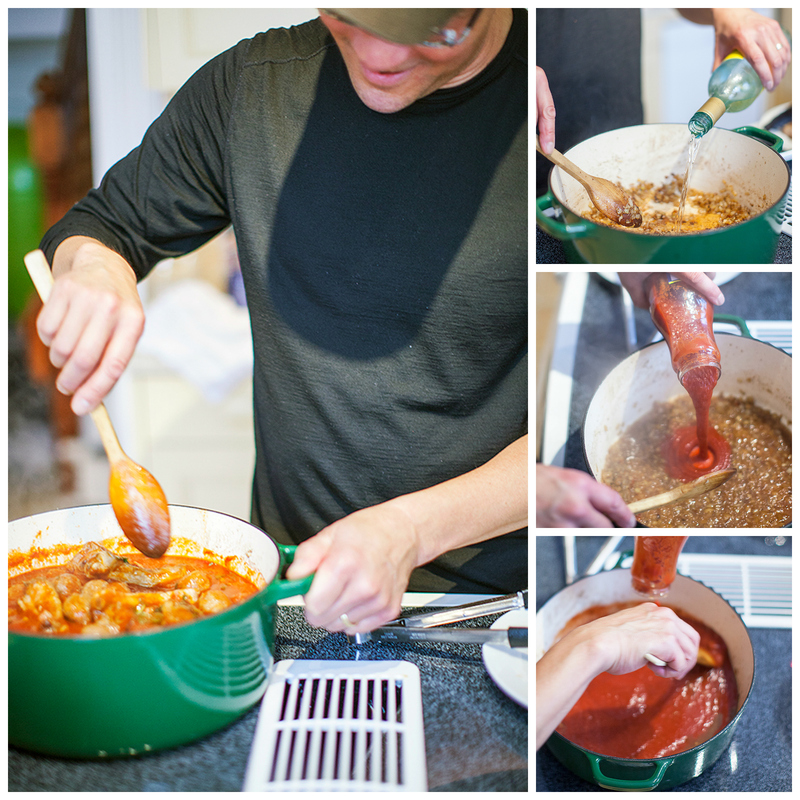 His sauce has a rich, deep flavour from the hours of simmering his selection of meats, onion and dried herbs in the tomato base. Make the meatballs and set aside until later. Add ribs in batches, brown and remove to a platter. Add sausages and brown on all sides. Remove to a platter. Add beef and brown on all sides. Remove to a platter. Sauté over medium heat stirring frequently and scraping up any bits left behind by the meats, until the onions are soft and golden. Put the meat back in the pot with any juices from the plate. Add tomato passata and gently stir to combine with meat. Gently drop in the meatballs, 1 at a time into the sauce, shaking the pot a bit to encourage them to nestle in with the other meats and to make room for the addition of more meatballs. Drop in the cheese rind and bay leaf. Cover the pot, bring to a boil; decrease the heat, and simmer on the lowest heat until meats are tender. Up to 6 hours. Stir often and enjoy the aroma! THE LOVE: When you’re frying the meats, work in batches to avoid the meat sweating. Also, watch the liquid throughout the simmering process. You don’t want the sauce to go below the level of the meat. Add a little water when necessary. The recipe makes lots so invite a house full this Sunday and dig in! This entry was posted in italian food and tagged meat sauce by Michelle. Bookmark the permalink. Lucky me, that I was invited to taste this creation – which was yummy. It really was! I ate the leftovers all week. the tweeks are the magic!